These mollusks are found throughout North America, particularly in moist, temperate climates. Snails require calcium for their shells, so are less common in areas where this mineral is lacking. 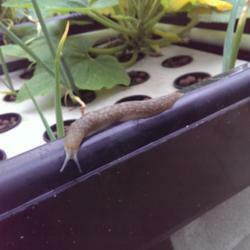 Slugs are gray to black or brown and soft-bodied, often with soft hump in center; snails have a hard calcium shell. Both snails and slugs feast on just about any plant, especially young tender transplants, leafy vegetables, and succulent plant parts. Their presence is indicated by large irregularly shaped holes in the leaves of plants and shiny slime trails. They are active mostly at night and in wet weather. Slugs and snails are very prolific; individuals of some species lay up to 500 eggs per year. Make plants less accessible by reducing daytime hiding places in the garden. Handpick and destroy slugs and snails as you encounter them; you can capture more by "hunting" at night. Fill shallow containers with beer and sink them into the soil to trap slugs and snails. Surround plants with copper barrier strips -- they give slugs a slight shock on contact. Poisonous iron phosphate baits are a safe alternative to other pesticides. Decollate snails prey upon other species of snail and slug, as do toads.